I give Millennials a hard time, no doubt. A certain segment of that generation absolutely wastes too much time and too many opportunities playing video games, trolling social media and surfing the internet for useless ephemera. Money burns a hole in their debit cards and they are often the antithesis of “savers.” In the end, however, as a recent reader very bluntly pointed out to me, us old folks have set them up to fail. Yes, needing a ‘safe place’, having extreme ‘micro aggression’ angst and playing Pókemon Go have put a royal bullseye on their arses, but that is simply a matter of immaturity. Like we all did, Millennials will eventually grow up. The real issue is how previous generations have screwed Millennials out of their inheritance. From education and housing costs to the crippling national debt, their future is really grim. Whether you want to blame capitalist greed, or the big spending and insane policies of progressive, libtard politicians, our current Ponzi economic scheme has screwed our children. A former Millennial coworker of mine, who made the classic Millennial mistake of getting a college degree in “Useless Studies” found herself working for my company for barely above minimum wage. Setting aside her poor judgement at age 18 (mine was no better), she was quite eloquent about her generation’s hopes for the future, and they were quite without hope at all. In our lives, the average person in industrial, first-world countries, will make four major purchases. I attended Oregon State University from 1984 to 1990. The sum total of my six years, including summer lodgings was $36,000, or $78,000 in 2018 dollars. I graduated with $2,000 in loans. I paid that off real quick. The 2018 cost for six years at OSU is about $180,000, or $82,000 in 1987 dollars. Had I paid today’s prices (time and inflation adjusted, of course), I would have graduated with a stifling $46,000 in loans. $600/month! In order to be flexible enough to get a good job, get married, and have a family, you need reliable transportation. In 1990 a base Ford Explorer cost about $20,000, or $38,000 in 2018 dollars. Today, a base Ford Explorer will run you about $34,000. Whew! At least cars still cost about the same. We bought our first house, a little 1100 square-foot ranch, for $67,000 in 1991. For now set aside the fact that, had I been paying student debt to the tune of $600/month, we could not have afforded a $700/month house payment. Today, that same little ranch house, according to Zillow, sells for about $360,000, or $180,000 in 1991 dollars. $180,000 would have bought us a mansion in 1991! Today it buys a cracker box. Interest rates were high back then, 9.5%, so the payment on $180,000 would have been $1,400/month. Even at today’s rates, the payment would be $800/month in 1991 dollars. That is simply not affordable. Even my generation, GenX, cannot rely on Social Security and Medicare to provide more than token support in retirement. Millennials are going to have to foot their entire bill. They already owe a $60,000 piece of a growing national debt, inherited from their parents, so their ability to save for retirement is ham-strung from the time they graduate high school. If a married couple cannot manage to save one million or more dollars, adjusted for inflation, by age 65, their retirements will be quite spartan. Lets do a simple Millennial vs GenX life cost comparison adjusted to 2018 dollars. -Six years at Oregon State University, with student loans at 8% over 10 years. -First car a base Ford Explorer with GenX loan 8% and Millennial loan 4% over 5 years. -First house 1100 square foot ranch, Beaverton, Oregon, with GenX initial mortgage 9% and Millennial initial mortgage 4.5% over 30 years. This means, for every year of our adult lives, age 24 to 64, GenXers get the equivalent of an extra $23,000 to spend or save. Unfortunately for you Millennials, the majority of us spent it. Today, 64 year-old married couples average about $170,000 saved for retirement. Take out the handful of super-savers who raised the curve, and the 64 year-old median retirement savings drops to $17,000. Most GenXers will be mostly broke when they retire. Sure, you can jiggle the numbers a bit to change the outcome a little, but the underlying issue remains. Millennials, young adults in their 20’s and early 30’s, will have to overcome unprecedented financial obstacles if they are to achieve the American dream. Their parents are broke and the Millennials are submerged in debt. It will be as great an American trial as the Great Depression was a century ago. While today we see Millennials as hypersensitive, wasteful slackers, I bet their grandchildren will see them as hard-nosed misers. Unfortunately, the Millennial road from slacker to miser will be a rough and lean path. The sooner Millennials stop whining and adopt a more ascetic lifestyle, the better. Despite maintaining a personal appearance similar to Bill Nye the Science Guy, Congressman Earl Blumenauer is Oregon’s most progressive, left-leaning D.C. politician. In an open letter to his constituents February 2nd, 2015, America’s favorite marijuana advocate railed against our government’s failures over the past six years. Corporate profits have doubled and America’s top 1% have given themselves hefty raises every year since President Obama took office. Technological developments are up, worker productivity is up, and profits are up, yet middle-income wages are stagnant or in decline. Student debt is crushing our young generation. Our highway infrastructure is crumbling. The Social Security Trust Fund is rapidly approaching insolvency. Our tax code is in disarray. Our government is an inefficient bureaucracy. Blumenauer thinks he knows how this happened. That is right folks, Congressman “Marijuana” Earl says that our left-wing, progressive legislators and our left-wing, progressive president, a group that added nearly $8 trillion to our national debt in six years, did not “borrow and spend” enough to properly get this great country back on track. Fiscal responsibility is the problem and debt in the answer. I am here to tell you his bow tie is too tight, and this squirrelly loon’s brain is oxygen deprived. Our growing Federal debt is the root system that is feeding America’s demise. While our National Debt has increased nearly 18 fold over the last 34 years, our per capita interest payment on that debt has remained virtually flat. Today every man, woman and child in America owns a $56,000 share in our National Debt. 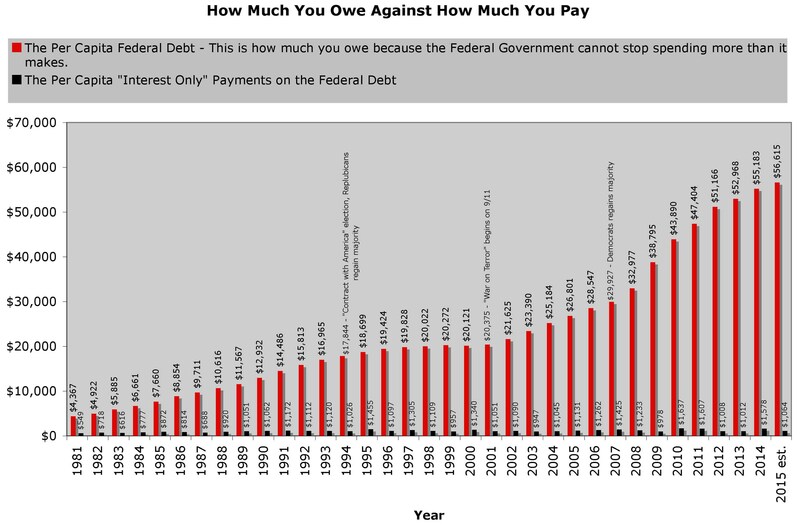 This is the reality of our Federal Debt. The 2014 median income for an American household is about $51,000. The Federal Debt per household about $141,500 – almost three years wages. In 1980 the median household income was $16,354. The Federal Debt per household was $10,000 – less than 8 months wages. That money is owed and that money has to be paid back. 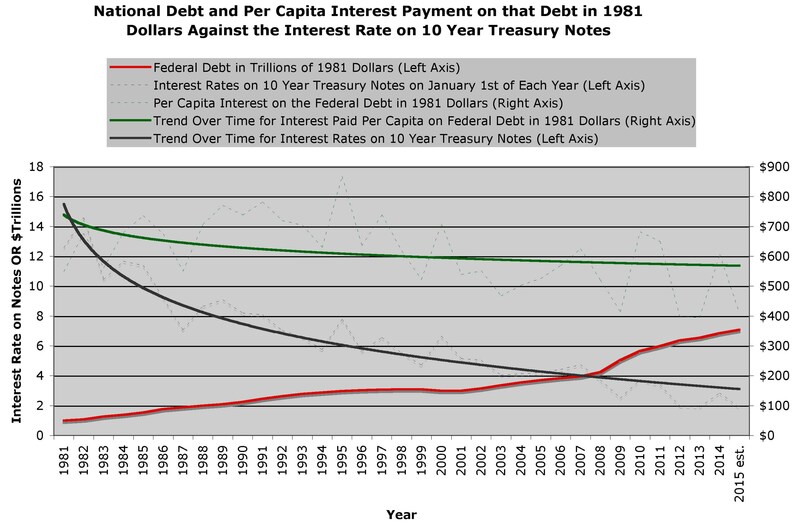 The problem is that the Federal Government currently only makes interest payments. It never pays down principal. Without a plan to pay off this debt, the only other way to get it off the books is to devalue our currency with inflation. For instance, $1 trillion of 1981 money bought $1 trillion of 1981 goods. Fast forward to 2014, and that same $1 trillion only buys $380 billion of 1981 goods. Through the use of inflation the U.S. Government effectively paid off $620 billion of debt without actually paying a dime of principal. Our Federal Debt is made of Treasury Securities (notes, bills & bonds) that people purchase at a guaranteed interest rate. In essence, people around the world lend the U.S. Government money at a certain interest rate. As long as the rate of return on Treasury Securities exceeds inflation, they are a very secure way to grow your money. The Government has to pay the interest on the note for its duration and then return the loan when the note is due. It is the annual interest payments that are the immediate problem for our Government. The Government cannot afford ever-increasing interest payments on an ever-increasing debt. The historic solution has been to cut interest rates as the debt grows to make the payments manageable. As a matter of fact, if we present the National Debt in 1981 dollars for the last 34 years, every time our National Debt doubles, the rate on 10 Treasury Notes has been halved. In terms of inflation adjusted 1981 dollars, the rising National Debt and falling rates on 10 year Treasury Notes are inversely proportional. This keeps the cost of servicing an ever-increasing Federal Debt affordable for a government that is having increasing cash flow problems. There are only so many times you can cut interest rates before the rates fall below the inflation rate. Once interest rates fall below the rate of inflation, loaning money to the U.S. Government actually becomes a money loser. Right now the rate on 10 year Treasury Notes is about 2%. If the rate of inflation is higher than 2%, then whoever owns that note is actually losing money in terms of its buying power. This why the Government spends so much time tweaking the Consumer Price Index. Regardless of what the real inflation rate is, they have to come up with a reportable inflation rate lower than the rate on 10 year Treasury Notes. The trouble with this is that by the early 1990s our National Debt had grown to such a point that the reported inflation rate was higher than the return on 10 year Treasury Notes. So the Fed created a new way of calculating the Consumer Price Index. Instead of comparing the price of prime-rib from year to year and coming up with the rate of inflation for prime-rib, the Fed decided to compare the price of prime-rib to hamburger. If prime-rib gets too expensive, consumers are supposed to switch to hamburger. If hamburger gets too expensive, consumers are expected to switch to fried dough. As long as there exists a cheaper alternative, inflation does not exist until such time as the cost of fried dough exceeds the cost of prime-rib. Call it a Means-Tested rate of inflation. If you are poor, and never had the money to buy prime-rib in the first place, your inflation rate is higher than the inflation rate for the rich, who can switch from prime-rib to hamburger to save money. This is why some people at The Economist very cleverly came up with the “Big Mac Index” as a way to monitor real inflation. The price of a Big Mac sandwich at McDonalds represents a composite of the cost of wages, energy, transportation, basic food stuffs, productivity and profits. Since 1990, the average annual inflation rate of the Big Mac sandwich has been 3.45%. The pre-1990 CPI calculation method says the average annual inflation rate since 1990 has been 6.0%. The Federal Government, using their new Means-Tested CPI has reported an average annual inflation rate since 1990 of 2.63%. The average return on a 10 Treasury Note since 1990 is 4.86%. It appears as though the Government is intentionally under-reporting inflation, so I decided to average the new Means-Tested CPI, the pre-1990 CPI, and the Big Mac Index and come up with a “more accurate” estimate of inflation. For the last ten years the rates on 10 year Treasury Notes have been lower than this “averaged” rate of inflation. That is really bad news. If the government continues to deficit spend, the rate on Treasury Notes will have to continue to decrease if this game of smoke and mirrors is to continue. Unfortunately, you cannot go much lower than 2% interest, so there is little room to drop Treasury Note interest rates. If interest rates start to rise, then the cost of servicing the debt will bankrupt the country. This, folks, is the trouble with “Marijuana” Earl’s solution of spend, spend, spend. 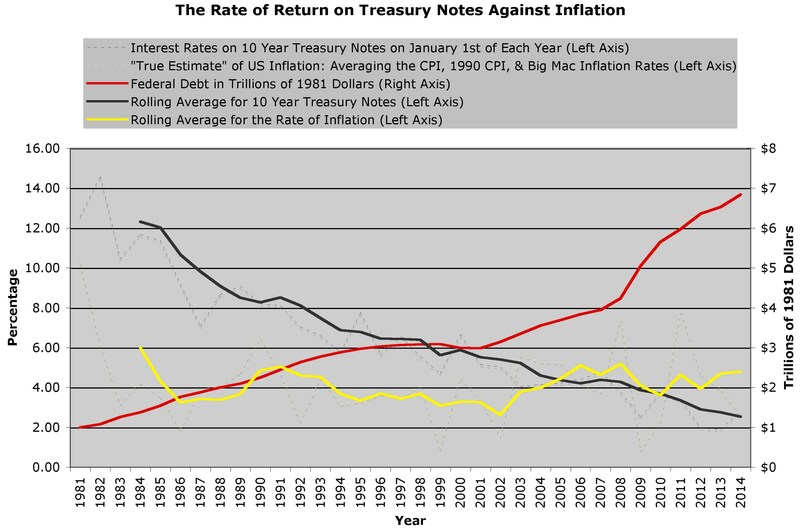 In 2005 the rate of return on 10 year Treasury Notes fell below the real rate of inflation. The same goes for 5 year CD rates. The LIBOR rates fell below the rate of inflation when President Obama took office. The really bad news is that chronically suppressed interest rates royally screw the middle-class. Big Business is using this unprecedented access to cheap loans to further automate their businesses because low interest capital is cheaper than labor. This drives wages down as people desperately attempt to compete with machines for jobs, while driving corporate profits up. Ronald Reagan was wrong and George Bush was right. Trickle-down economics really is Voodoo economics because greed rules the world. The super-wealthy simply are not sharing these massive profits with the common man. Since Obama and his left-wing cronies took power in 2009, the wealthiest 1% of Americans have increased their wealth from 34.6% of America’s total wealth to 40% of America’s wealth, creating the greatest wealth gap since 1929. This means that new college grads, kids with massive debt at ridiculous interest rates by today’s standards, will not be able to find a good paying job courtesy of our massive National Debt. Thanks to the National Debt, there are no “safe” ways for the middle-class to grow their money in retirement. While the super-wealthy can afford to lose risk capital, most of America’s middle-class cannot, and few middle-class Americans have the kind of investment savvy required to take investment risks after retirement. For every retired investor winner there will be a slew of retired losers. With 10,000 Baby-boomers retiring every day, how do you think their collective future is going to look from an investment perspective? While “Marijuana” Earl accurately identifies many critical problems facing today’s America, his “deficit spending” solution is simply not viable. Perhaps the reason Congressman Blumenauer is such a strong marijuana advocate is he is counting on the drug’s ability to neutralize critical thinking skills. Perhaps he is hoping Oregonians will be too stoned to notice just how far left he has drifted.